It's been over a month now and some of the locals in the community are still in an uproar. Why you ask? Because we made CNN news and Reuters news and AP news. And why would this sleepy little rural community make national news? Simply because the crime fit the punishment. Meanwhile, I'm doing a slow burn because many who are spouting off at the mouth do NOT know all the details, and even if they did it likely wouldn't make a fiddler's damn worth of difference. Now as to what caused this pandemonium? Here is a quick synopsis of what happened. Back in April, an 18 year-old went to the convenience store, Gordy's Tiger Mart, in front of the trailer park where she lives. Her name is Sherelle Purnell. Ms Purnell pumped $4.52 worth of gas into her car. She then went into the store, inquired over the price of cigars, decided not to purchase any—and left without paying for the gas. By the way, this was NOT an oversight, it was simply a ruse to become overlooked as she left without paying. Ms. Purnell was arrested and faced court. 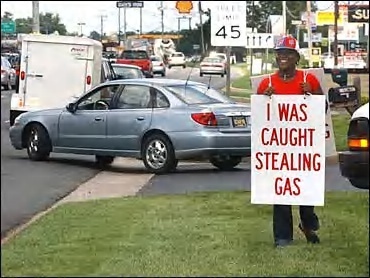 The store manager, Jan Phillips, and Judge Simpson agreed that rather than putting tax dollars to waste by installing Ms Purnell in jail, the penalty for Ms Purnell's crime would be to walk in front of the convenience store with a sign draped about her announcing her crime—"I Was Caught Stealing Gas". Ms Purnell was to arrive at noon and walk in front of the store for three hours. The sentence was to be carried out on July 30th, a Friday. When the day came, suddenly it was BIG news. News cameras from all over were there, including CNN. The appointed time came and went. The local paper opted to try to help the woman out and went to her home, just a few hundred yards behind the store. Ms Purnell stated that she didn't know it was for that day. She called the store, pleaded that she forgot, and said she'd be there later. The store manager allowed Ms Purnell another hour and a half to ready herself. About 1:30 PM, Ms Purnell comes walking up the lane with her boyfriend, her children, and a group of her friends. The store is a busy one and most of the media had left by then, but business was brisk as this mart maintains the lowest gas prices in town. Ms Purnell came into see Ms Phillips and asked not to walk. Ms Phillips replied that she had to and handed Ms Purnell the sandwich board. Ms Purnell put it on, and defiantly strode to the grassy median at the front of the store separating the busy Route 13 traffic. Puffing cigarette after cigarette and drinking down Pepsi® on a very hot day, Ms Purnell waved to all the traffic and the horns that blew at her. She felt she was a celebrity and those who beeped as they went by were on her side, that what she'd stolen had won her a small bit of fame. That somehow stealing had made her famous, after a fashion, so maybe it was cool afterall. She opted not to recognize the derision and catcalls that came from the highway. Now it WAS a very hot day. Another fellow wishing the limelight, made up his own sign and began to walk with her in hopes of getting his name in print. It worked to a degree, but all those who saw him knew he wanted his picture in the news as well. He was later told to leave the property; he thought it was funny too. He adopted a barking litany about dark-ages punishment, after he'd already patronized the store which provides mixed messages. Why on earth would you patronize a store if you vehemently disagree with their policies. Rest assured he ran right home and got a video tape out to record his 8 seconds of fame. About 45 minutes into her walk, still puffing away cigarette after cigarette (hot-boxing them)—and the loss of the media attention as they'd now slipped away, Ms Purnell suddenly flagged and made her way back into the store to see Ms. Phillips pleading she had ASTHMA, and forgot to bring her medicine. Not one of her family or friends would make the 3 minute walk to her home to bring said medicine—if it actually existed. Ms Phillips provided Ms Purnell with a chair to sit in the shade right in front of the store and chilled, bottled, water. Then Ms Purnell and her entourage, began pan-handling customers as they entered and exited the store for another 40-50 minutes. Ms Phillips then asked Ms Purnell to please finish her walk at that time. Within 15 minutes, Ms Purnell was back—before 3:30 pleading her Asthma condition again. At that time Ms Purnell was allowed to leave the premises. Once excused, her energy levels and ability to breathe improved dramatically. Ms Purnell, her boyfriend, children, and her friends, left in a large, laughing group, sashaying and singing down the lane to her home. Did I mention that she never once stopped puffing away on her cigarettes during the entire visit? The circus was over, the media had long ago left—few witnessed the shameful behavior of Ms Purnell and her friends. The media also didn't witness the compassion shown by Ms Phillips when Ms Purnell began to dramatically heave and huff and puff, as if she were actually having an asthma attack—said she left her medicine at home, but not a soul from her pack of folks rushed off to get it for her either. Ms Purnell's recovery was amazing to watch. I think the final straw for me was a letter to the editor in our local paper, just yesterday, Saturday, August 21st, where some poor embarrassed soul began to spout that the local clergy should have gotten involved and prevented punishment by humiliation. The attempt was a sorry one and not even legal. Then it even went on to say that "There was no money involved." Yep, I guess there wasn't because Ms Purnell didn't pay for what she stole. There is NO WHERE in the bible that states stealing is appropriate and just. If those that want to screech and caw that public humiliation is a horrid, wretched thing, what about back in school? If you are caught talking too much, many teachers will put forth the punishment to write out, "I will not talk in class," 500 times to be turned in the next day. Yes, it's an exercise, but the entirety of the class knows that student has to go home and write it out. Is that too harsh a punishment? NO. This remedy saved taxpayers an inordinate amount of money because we didn't put Ms Purnell in jail. It is also a warning to anyone else who will steal from that store. For me, I think it's quite fitting that it received national news attention. It should. We also should do this more often. However, it would be truly beneficial if the perpetrator felt some guilt, embarrassment, or humiliation. Ms Purnell showed none. She also finagled her way into reducing her sentence and badgering all those around her so she could get out. Be very sure she laughed all the way home. And, as to that writer that espoused pulling in the clergy to protect her, he needs to be more aware of the facts of the case and not simply about feeling embarrassed because his community was in the news. Further, he needs to re-read the Constitution and the Bill of Rights. Separation of church and state are what founded this country. Forcing someone to into church is blasphemous—not to mention illegal. Even if you could, Ms. Purnell would remain as unrepentant as she was that late July afternoon. Remember, she thought it was funny. Kinda makes you wonder how low we've devolved. Scary thought isn't it?